Like Mark Twain before it the news of the death of SBS has been greatly exaggerated! What Microsoft actually said was there would not be another version of the on premises version of SBS developed. SBS 2011 is the last one, but it is not dead yet. It will be available for a year through most channels and a year and a half through the oem channel. It will be supported and patched. That is not dead, that is ample notice that there will be no new version, so if you need an on prem suite get busy and deploy it now. This is in sharp contrast to how they handled the death of EBS where they just pulled the plug while the next version was in Beta. I am not telling you there are not big changes afoot, there are. But you have time to figure out what you want to with your business and what direction you want to take it. 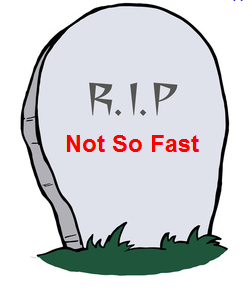 There are still going to be clients not in a mad race to the cloud and they are going to need servicing. You have ages in computer time to adjust and learn some new technology so when SBS is really dead you have the skills to still deliver an on prem solution stack, most likely based on some virtualization technology. And yes you are going to have to learn how to install the pieces you want in your stack, daddy is not going to do it for you anymore. Don’t get me wrong I have loved SBS through its entire existence, but this is not the end of the world. If you were you I would be more concerned with Microsoft’s abandonment of the SMB Channel in favor of its enterprise partners as well as direct delivery of software and services via the cloud. This seems to me to be a bigger threat than the end of SBS which they have been slowly deprecating since its heyday in 2003. This may be just what the User Group or IT Pro Group world required to start a long needed revitalization. Microsoft is not going out of the software business, just changing the rules of how we need to do business with them and opening the door for someone else to step in and lead the SMB Channel that they apparently no longer care about. We need to figure out how to do business with Microsoft as an adversary instead of a partner, because like it or not they still have the solutions most of our clients want/need. So we must find a way to move forward that is profitable for us and profitable for Microsoft, for if we don’t we will all need to learn to flip burgers and if we do that, we certainly will drive down the value of burger flipping. So as you can see the sky is not falling, this is just your wake up call to get busy and take the reins of your future and stop letting Microsoft drive your bus, hop up in the seat and take the wheel!